“Feather Your Nest” is a figure of speech related to traditional bedding materials. It refers to the mother bird lining her nest with feathers and down for softness and insulation for the eggs she would lay and the chicks that would hatch. It came to mean providing one’s home with better things, including more comfortable bedding, such as a featherbed. “Hit the sack” means “Go to bed.” Early mattresses were essentially sacks, and a sleeper would sink into the sack while lying on it. “The sack” was filled with supportive and cushioning materials. Before filling sacks, people would pile the cushioning materials where they were going to sleep, then lie down on them. Pillows, of course, are also sacks, primarily used for supporting one’s head. It is also where many persons expect more softness along with support. The terms “featherbed” and “down pillow” have connotations of luxury, and for good reasons. At a time when most mattresses were sacks filled with straw, leaves, wood chips, rags (whatever was more cushioning than a dirt or stone floor), feathers and down were the softest cushioning materials available. Not only were they cushioning, they were also insulating, keeping the sleeper warm when the floor was cold. Down and feathers were also not as readily abundant, and therefore costlier, especially down. Featherbeds and down duvets (a type of comforter) were prized possessions, even heirlooms. These materials did become more available with the domestication of waterfowl, especially ducks and geese. Down was collected from nests during brooding and after molting, Feathers were also collected after molting. Some farmers plucked the breast down of live ducks and geese three or four times a year. Both feathers and down were plucked from birds slaughtered for meat. Some people think of down as small or immature feathers. Actually, there is a distinction. There are two types of feathers used in bedding: down (or downy) feathers (collectively down) and contour feathers. Other types of feathers include tail feathers and wing feathers. Down is almost all fluff – literally. As shown on the left side of the illustration, filaments (strands) radiate out in all directions from a down feather. These filaments are scaly, so they tend to hang onto strands of other down feathers. The down quill is no more than the part that extends into the follicle, which is not as stiff as the shafts of other feather types. Most newly hatched birds have down before feathers. However, it is waterfowl that have down as adults. It gives them bouyancy and insulates them from cold water. Oils in the down and the contour feathers keeps the skin dry. Down strands are springy. They can be pushed down, but spring back into shape when pressure is lifted. This gives down its loft (height) and its fill power. Fill power is a measure of how much support the down has. The larger the down feathers, the higher the fill power. Besides bedding (mattresses, pillows, duvets, and comforters), down is also used in cold weather clothing, such as hunting vests, ski suits, and Arctic-grade parkas. Underscoring the desirability of down, it has been a commodity of international trade for a long time, several centuries and longer. The most valued downs are from eider ducks and from geese. Eider down is the softest, and goose down has the highest fill power. There are several types of feathers other than down. The ones prized for cushioning are the contour feathers, especially those from the belly and breast of the bird. Short and cupped at the rounded tip, these are much softer than flight or tail feathers. Instead of strands, they have parallel barbs on each side of the quill. Each barb has barbules (little barbs) which interlock with those on the next barb to keep them aligned. This is what gives a feather its shape while keeping it lightweight. Contour feathers do not have the same fill power as down. They naturally tend to align with each other, which flattens them out. This is analogous to flat sheets of paper lying flat on each other while crumpled paper takes up more space. Feather pillows usually also contain some down to give them more loft. Including contour feathers in a down pillow makes it less expensive. Down and feathers are used in three categories of bedding: featherbeds, covers (duvets, comforters and blankets), and pillows. In all of these, the cover fabric and the seams have be tight enough to keep the feathers and down inside. The oldest use for feathers and down in bedding was in the featherbed. This was and is a kind of mattress. Early on, it became quilted – sewn through in crossing sets of parallel lines to form boxes which keep the feathers and down from shifting. This also made the featherbed easier to handle. If well-made and well cared for, a featherbed would last for many years and become a treasured heirloom. The featherbed was (and is) used more for comfort and insulation. It was usually placed on a firmer mattress (whether straw, cotton, springs, or foam), putting it in the role of a mattress topper, almost as old as the pillow. 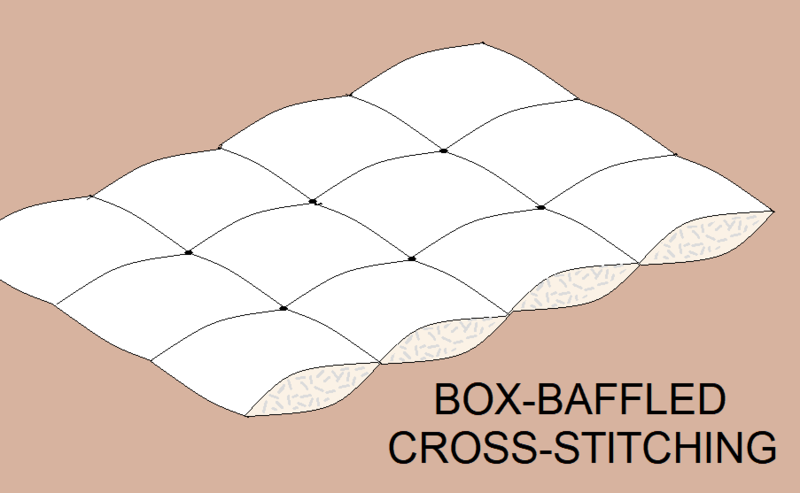 In a sense, this use of the featherbed was the prototype for multi-layered mattresses with softer materials in the top layers. While down duvets, comforters, and blankets are all down-filled covers for sleepers, there are distinctions. All are filled with down or down and feathers. Almost all are now quilted (stitched through) to keep the filling from shifting. A blanket is thinner than a comforter. A duvet is like a comforter with a protective cover. The down in a cover is for lightweight insulation. Down blankets can be used year-round. They can also be layered for cooler room temperatures. Since it is thinner, a blanket is more breathable than a comforter. The thicker down comforter may be less breathable than one down blanket, but is more breathable than two or three. This makes it preferable for Winter. A duvet has a protective cover over a quilted down-filled insert. The advantage of this over a comforter is that the outer shell of the duvet can be washed. However, with the extra layers of fabric, a duvet is less breathable than a comforter. For a long time, feathers and down have been popular in pillows. This was especially true before foam and polyester fiber became a popular pillow fillings. Even now, with the popularity of memory foam and latex pillows, there are many down pillows available, both in stores and online. Some pillows with synthetic fillings, such as polyester fiber, microfiber, and shredded memory foam, are billed as “down alternative” pillows. The primary advantage of down and feathers in bedding is softness, especially for down. In fact, downy has come to mean soft. Down has the advantage over feathers with its absence of hard, sharp quills. Another advantage of down over feathers is keeping its loft. Feathers tend to line up and flatten out. Down is very insulating for its weight. It also wicks moisture, helping keep users dry. Users can turn down the heat, making the air more breathable and saving energy costs. However, if down is very wet, it is both heavier and less insulating. Down and feathers are breathable. This is because of the open space within the mass which also makes it light. Down and feathers are also long-lasting if cared for. Another advantage of feathers and down for many people is that they are natural products. There is no oil to drill or coal to mine, no chemicals to mix, no volatile organic compounds. A drawback of both down and feathers is that they tend to fall flat with use as the material shifts. A skill expected of users of down pillows is plumping them in the morning. Foam, including memory foam and latex, holds its loft, even with shredded foam. Another drawback of down and feathers for many people is allergies. Actually, most persons are not allergic to the down or feathers themselves. The allergens are dust, dust mites, bacteria, and fungi which may be carried in the material. 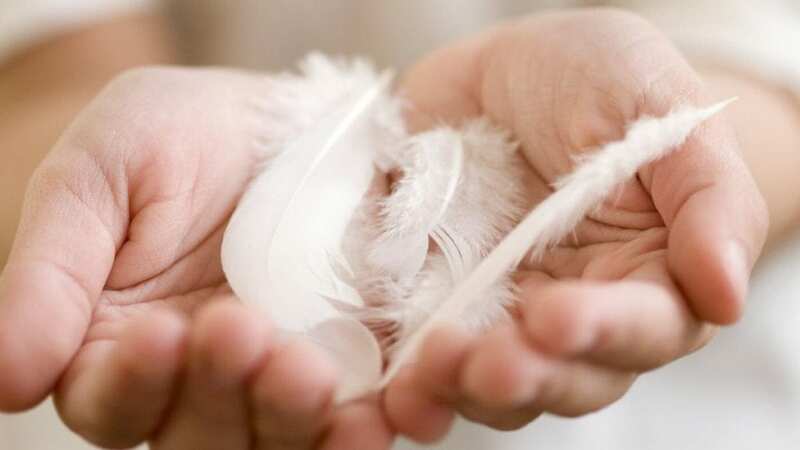 Down and feathers can be allergy-free if properly cleaned and sanitized. Still, many prefer foam over down because of allergies. Read more about down and feathers in Part 2: Marketing, Sourcing, Issues, and Certifications.